Suremount attachment tapes are customizable based on your adhesive strength requirements. Double sided mounting tape bonds a variety of substrates and applies cleanly and conveniently. Our closed cell, cross-linked polyethylene foam carrier is available with a variety of adhesive options to meet your bonding requirements. 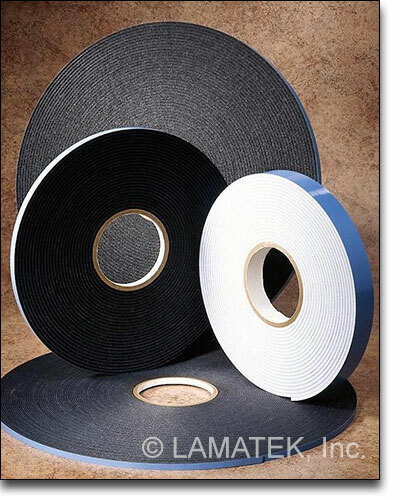 Whether you require permanent, heavy-duty adhesion or lightweight attachment properties, LAMATEK has a double sided tape for you. All-purpose adhesive system ideal for indoor applications or lightweight hanging that does not involve UV exposure. Advanced acrylic adhesive provides excellent bonding strength and higher shear and tensile strength as well as mild UV resistance. When your application requires extreme bond strength, extended UV exposure or water resistance, SureMount EM is the answer. Ask us about a custom put-up fit for your manufacturing process. Can your mechanical fasteners do that? Double sided mounting tape provides consistent adhesion across the entire bonded surface without pressure points that can wear and create surface stress. They also save on time, tools and labor by providing a simplistic application. Just peel and stick.